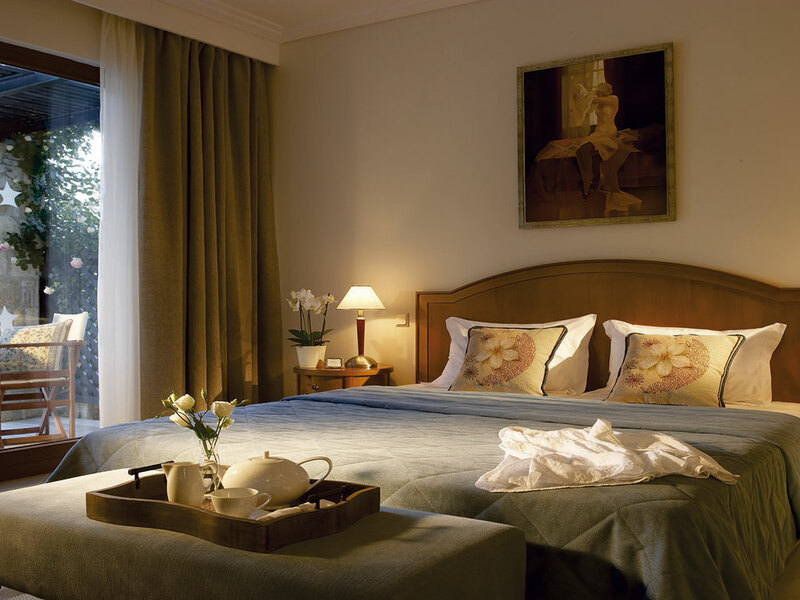 Luxury hotel consists of 2 central buildings, two-storey and single-storey bungalows. Located on both sides of the road, connected by an underground passage. Elegant style, comfortable rooms and suites, 9 pools, private pools, restaurants and bars, kids club, Spa center, sports and entertainment, high-class service, unique natural landscapes, a private sandy beach. Ideal for a comfortable exclusive vacation. 3 conference rooms with technical equipment: Makedonia - 550 seats, Alexandros - 250 seats, Vergina - 150 seats and a meeting room (without technical equipment) - 20 seats. Aegean SPA-center Massage, facial and body treatments, aromatherapy, thalassotherapy, pressure therapy, cellulite problems solving, programs for stress relief, general body strengthening. 2 central restaurants (one - in the building above the road) - served breakfast and dinner - buffet, a la carte restaurant, self-service restaurant. Dress Code: only long pants and closed shoes for men - during dinner. For women, too short shorts and beach or sportswear are not allowed. Kids animation - drawing, darts, mini-disco. AEGEAN SPA - a luxury worthy of you! The unique luxury SPA center "AEGEAN SPA" offers its guests to combine a pleasant stay with truly useful procedures that can relieve the accumulated psycho-emotional stress, restore the body tone, filling it with new power. youthful shine in the eyes. Qualified specialists of "AEGEAN SPA" own the most effective methods of restoring the body’s energy balance, regulating metabolic processes and reducing stress effects. 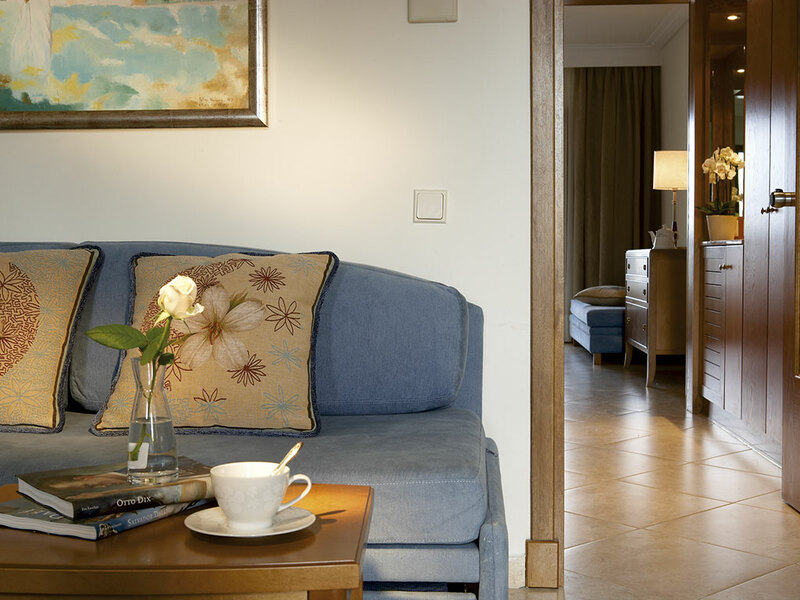 "AEGEAN SPA" is a space of calm and beauty, where time stops and sometimes even goes backwards. The person who reached 16-year age can be the guest of "AEGEAN SPA" of the center. Sauna, jacuzzi, massage, beauty shop (face care and body). Aromatherapy, thalassotherapy, pressoterapiya, anti-cellulite therapy, yoga, etc. MASSAGE COLLECTION FROM “AEGEAN SPA” - detoxification, excretion of slags, cleansing, improvement of lymph movement, “restricted area” (smoothes the skin, removes the “orange peel”, fights cellulite); “healthy back” (relieves back pain, removes muscle spasms, strengthens the muscular corset); "AEGEAN massage" (fortifying, healing, toning). The SAUNA of "AEGEAN SPA" is a unique complex of procedures directed to clarification and restoration of all organism. EXCLUSIVE BODY CARE FROM "AEGEAN SPA"
! Free use of the indoor pool with the heating (fresh water) located in the top part of hotel, gym and Turkish hammam. 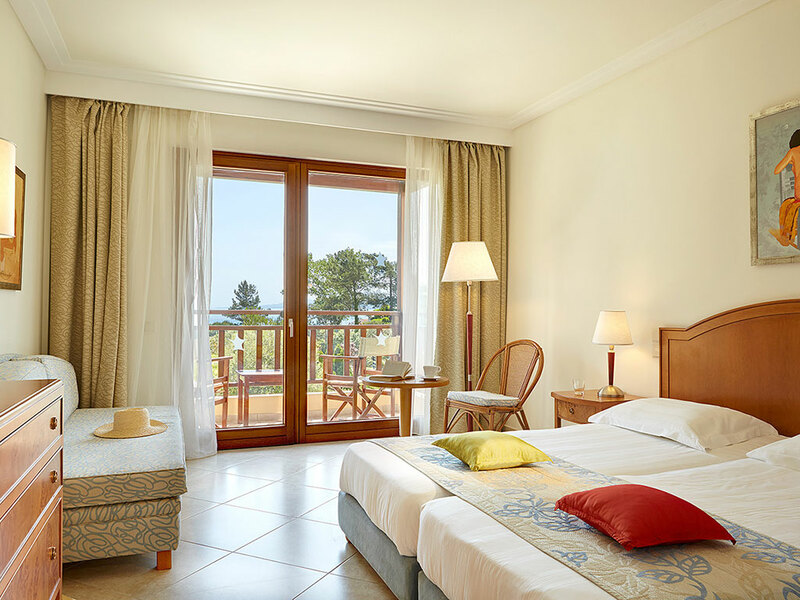 Peninsula Kassandra, 3 km from the resort village of Kallithea, 90 km from the Thessaloniki airport "Macedonia" It was redecorated in the rooms and in the hall in 2013. 255 rooms in total: Standard Rooms (~ 25 sq.m), Double Rooms Eco (~ 25 sq.m), Doubles Superior Sea View (~ 38 sq.m), Doubles Superior Pool View (~ 38 sq.m), Maisonettes (~ 50 sq.m), Suites (~ 60 sq.m), Suites Sharing Pool (~ 44 sq.m), Suites Superior Private Pool (~ 67 sq.m), Presidential Suite SV (~ 80 sq.m). 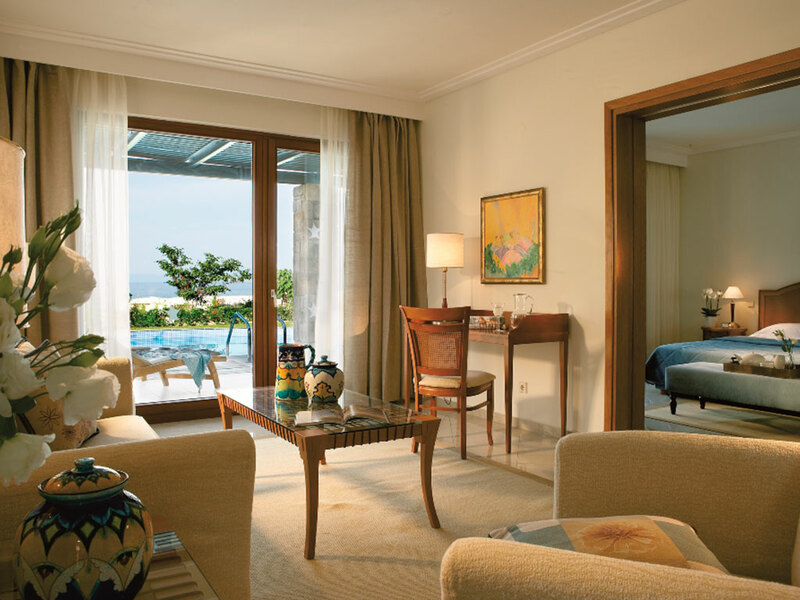 157 Standard Rooms and 83 Doudles Superior (in the central buildings and a bungalow), 15 Suites (in a bungalow). 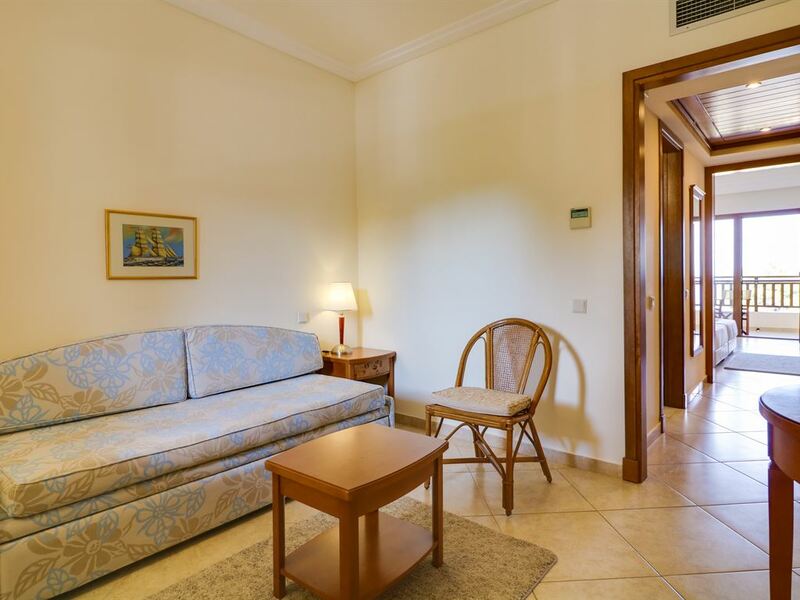 In the rooms: air conditioning, satellite TV (Russian channel), refrigerator (in the suites - mini-bar), telephone, safe (free of charge), bathroom (bath / shower, in some suites - jacuzzi), hairdryer, bath accessories, bathrobes and slippers, coffee and tea making facilities, furnished balcony / terrace. Type of extra bed - sofa. Upon arrival - welcome drink, as well as wine and fruit in the room. Standard Room Located in the central building and bungalow. View of the pool / garden or the sea. Double Rooms Eco Rooms are located in the central building. View of the road. Double Superior Sea View Located in the main building on the 1st and 2nd floors. Living room and bedroom, bathroom, in some rooms and private WC, balcony. Sea view. Double Superior Pool View Located in a bungalow (in the complex above the road), a living area and a bedroom, a bathroom, in some rooms and a separate WC, a balcony. View to a pool. 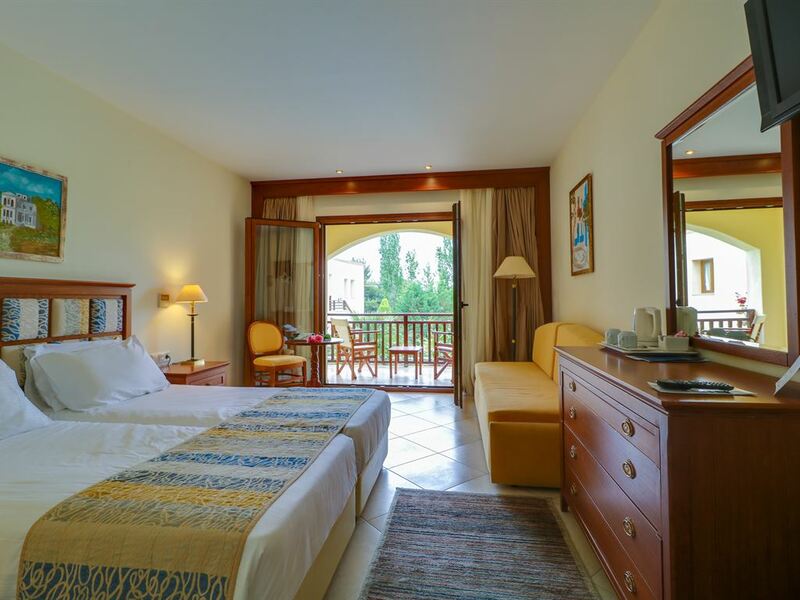 Suite-Maisonette Open-plan duplex rooms located in bungalows (on the first floor - living room, shower room, balcony; on the second - bedroom and bathroom (bathtub). View of the sea. Suite Located in a bungalow on the 1st floor. 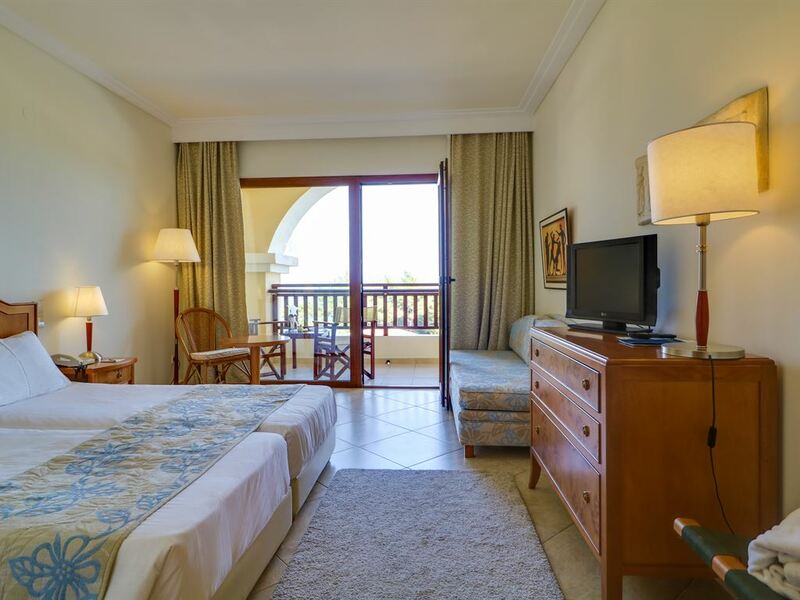 2 rooms (bedroom with door, living room), jacuzzi, 2 bathroom with shower, terrace, sea view. Suite Standard Sharing Pool Located in a bungalow. Private swimming pool for 2 suites (fresh water), 2 rooms (bedroom with door, living room), bathroom (bathtub), terrace, sea view. 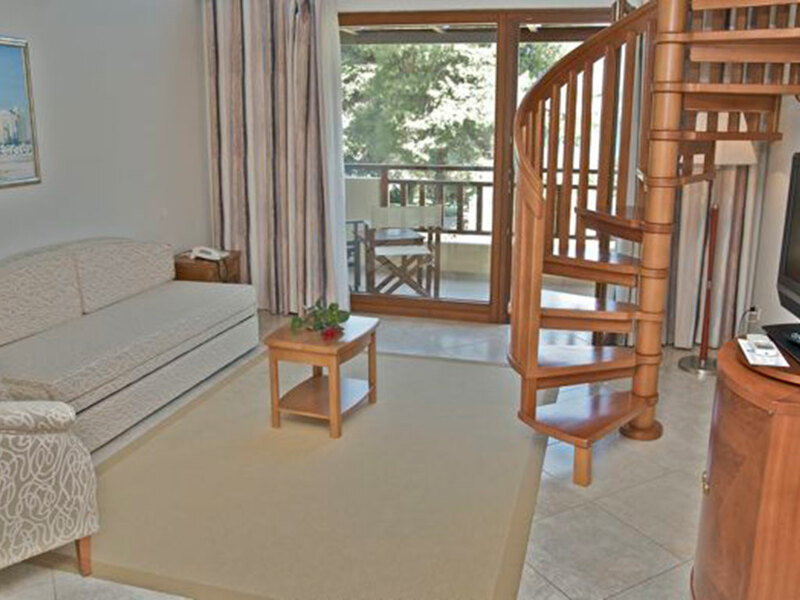 Suite Superior with Private Pool Located in a bungalow. 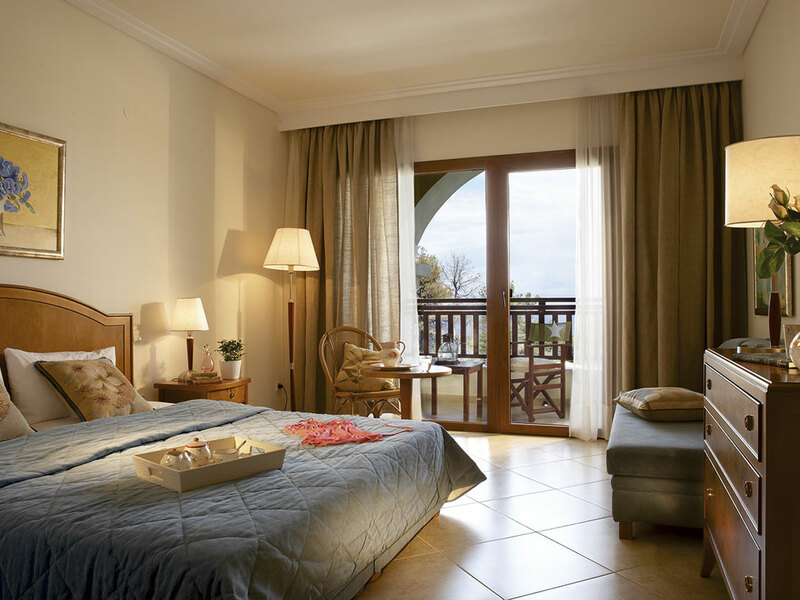 The personal pool (fresh water), 2 rooms – the bedroom with a door, the living room (in one of suites there is an additional small nursery with one bed), 2 bathrooms (1 - a jacuzzi, in the second - shower), a terrace, a sea view. Presidential Suite the Separate lodge with the private pool. 3 rooms (the living room, 2 certain bedrooms – everyone with a door), 2 bathrooms (1 - a jacuzzi, in the second - a bathtub). Daily cleaing service, linen change every other day.